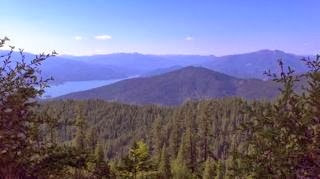 THPBlog: Sierra Pacific Industries to clearcut log near the eastern shoreline of Trinity Lake. Sierra Pacific Industries to clearcut log near the eastern shoreline of Trinity Lake. THP 2-13-081 TRI (Donkey THP) Sierra Pacific Industries, 401 acres; 96% clearcut, 3% roadside, 1% selection logging. Nelson Creek, Billie Gulch, Clawton Gulch, Hay Gulch, Hatchet Creek (MD: T36N R7W Sec.13, 23, 27, 33). Winter operations, high erosion hazard, steep slopes up to 70%, landslide terrain, impaired 303.d watershed, oversized units, herbicides, 1 spotted owl within 1.3mi, trees up to 36" dbh. Estimated public comment deadline: 12/04/13. This THP is about 2 miles SE of Trinity Center across Trinity Lake near the eastern shoreline. Sierra Pacific Industries is planning a mostly clearcut tractor and cable logging operation in Douglas fir, ponderosa pine, incense cedar, sugar pine and white fir forests at an elevation of 2,000 to 4,400 feet. This THP has some landslide terrain sites including a slump within a watercourse in unit 13E, and an unstable area in unit 13B. Ground based equipment is proposed for use in units designated for cable logging in unit 13E, and in units 13A and 27B, a skid trail is proposed for use on slopes over 65%, and tractors are proposed for use on slopes over 50% that do not flatten before reaching a watercourse. The THP includes 4 miles of new road construction, and a skid trail is proposed for use in a class II watercourse in unit 13A. Units 27B, 27C, 33B, and 33D are oversized. This THP will result in the loss of 2 acres of nesting/roosting habitat within 1.3 miles for spotted owl site TRI169, and the conversion of 42 acres of foraging habitat. Arnica venosa was found in units 27B, 27C and along several roads. More information is available on the THP Tracking Center website.